Working in conjunction with blasting and painting schedules to optimize throughput, Tranzblast’s diverse fleet offers a convenient transport service. Our fleet comprises of prime movers, body trucks and a range of trailers, tri-axle, extendable, step deck, drop deck, dolly’s and floats. 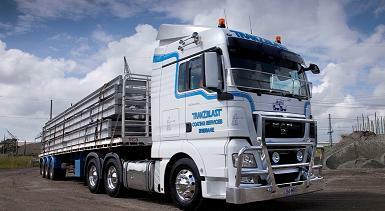 As Heavy Haulage Operators, Tranzblast pick-up and delivery capabilities extend beyond local and surrounding areas into the rest of Queensland, New South Wales and the Northern Territory. And, because many industries have oversize loads, we have the facilities and resources to handle large over-dimensional items supplying our own pilot escorts if required.